EnviroForensics CEO, Steve Henshaw, PG, spoke with Chris Nolte, the host of Lakeshore Public Media’s talk show, Regionally Speaking, to discuss the success of thermal remediation technology used at the former Family Pride Dry Cleaner and Laundry in Crown Point. They also talked about the property’s future, now that it’s back on the market and ready for productive use. Check out the interview to learn more. Chris Nolte: Well first, for folks who may not remember our last conversation, tell us what EnviroForensics does and how important it is in particular to the project you guys just finished up in Crown Point. Steve Henshaw: Sure. Thank you so much. EnviroForensics has been in business for over 20 years and we are a full-service environmental engineering firm. We investigate environmentally contaminated sites, and we design and implement the remediation. We get properties through the regulatory process – and get them back in productive hands to develop, reuse and get back on the tax roll. What’s unique about EnviroForensics is we have the ability to go back and find old insurance policies that were really written for normal slip and falls; these normal slip and fall Commercial General Liability (CGL) policies can be used to pay for the expensive cost of environmental cleanup and investigation. And, that’s what really sets us apart from the competition; we can go and find the money to pay for these cleanups, which can routinely be a million and a half dollars at a normal dry cleaner. Nolte: Tell us about this project, which we see here used to be known as the Family Pride Laundry, located on North Main Street in Crown Point. Many people drive by it, even now every day as they’re traveling north and south into and out of downtown Crown Point. This business has been closed for a number of years and I guess it’s been up for sale for some time but it’s not had much luck in finding a new owner because all of its past baggage, so to speak. Tell us what you folks managed to clean up out of that facility to be able to reopen it up again and make it “redevelop-able”. Henshaw: This was a site that was brought to us through the banks that the previous owner was working with. In many situations, when a business pays a loan to buy equipment and operate they commonly put up the property as a secured asset, and, in the business of environmentally contaminated piece of property, the bank may not realize what the business had as their secured asset. This is because when the business was no longer able to perform on the loan then the bank considered foreclosing on the property, but the bank doesn’t want to be the owner of a contaminated property. Henshaw: The bank brought us in and we were able to find a buyer for the note and then pursue the old insurance policy. It’s taken a little bit of time to work out those details, but once we got it all taken care of with the bank and the note was in new hands; we continued to pursue the insurance carrier. Then we investigated the dry cleaning site to determine the extent of the contamination and brought in a unique process of using thermal remediation, which heats up the soil and the groundwater, to fry off the volatile organics that are in the soil and groundwater. Old dry cleaners used chemical solvents, which are carcinogenic, to take creases out of fabrics and the solvents are heavier than water so they fall through the water columns. Really this is just a normal and routine part of the business, but these solvents can enter sewers or cracks in the floors through spills and unfortunately a little bit goes a long way. 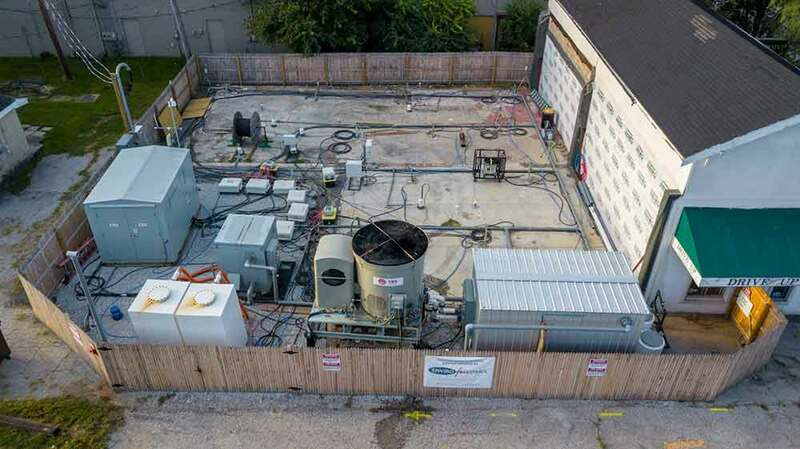 Many dry cleaners experience this environmental contamination, but in this situation, we brought in and employed a thermal remediation technology that worked with NIPSCO to bring in a high-voltage power line and heated the soil and the groundwater to near boiling. We implemented this in late May 2018 and shut the system down in early September 2018 and we had 99% removal of the contamination in just four months. So that’s what really makes this site unique. These are sites that can go on five, 10, 15 years and then the residual amounts of contamination that are still in groundwater and soil are still at levels that will require long-term monitoring of potentially 15 more years–just to monitor and make sure that the contaminants aren’t migrating off-site. But in this particular situation, we were able to get 99% of the contamination out of the soil and the groundwater in about 90 to 120 days. Nolte: Now, Steve, I understand that in this particular site, what used to be the Family Pride Laundry, there on Main street in Crown Point had what they call perc, short for perchloroethylene, which is a solvent that was used commonly in dry cleaning. So, a person takes their clothes in to get the spots taken out; at this point Family Pride was still in business and they’d use the perc in their machines, so what a lot of this was, I’d imagine, were just maybe accidental spills of perc, but somehow or another that didn’t raise concerns, and it still got into the groundwater, didn’t it? Henshaw: Yes, that’s correct. And the older machines didn’t have the same recycling capabilities, so often times, the perc was transferred to a distillation still to boil down the perc, so it comes overhead, it’s clean again and it gets reused. That’s just the process of recycling. Then you would also have these overfills and spills in the boiler system. You would have inadvertent doors popping open with this solvent. You would have just small releases, but over time, they accumulate into a large enough problem that the state and the regulatory agency gets concerned about the carcinogenic aspects in the soil and the groundwater. Nolte: This place opened up as a dry cleaner and laundry in 1961, I think if my info’s right, and was open until 2012 when the business finally closed up there, which means that site has been unusable pretty much since then. That is until you folks from EnviroForensics managed to help get the process going and get the cleanup started and finished. How do people feel now that the cleanup is down to 99% clean? You can’t get much cleaner than that short of just pure soil. Henshaw: Right. Well, we do have some interested parties that are knocking on the doors and would like to use the property. It’s been a bit of an eyesore for some time. So we’re excited about being able to put that back into productive use. That’s the name of the game here; try to get the cleanup done quickly and get the property back on the tax roll. Nolte: Now for folks that may not be aware what you folks have done. I know this is not the first project you’ve worked on in Lake County or Northwest Indiana. You’ve worked on a number of them before. And some rather environmentally dirty areas, too, I understand. Henshaw: Mhmm, yes. The dry cleaning industry has been something we’ve been closely involved with, but it’s not exclusive to that. EnviroForensics was involved with the East Chicago Waterway Canal project, the Gary Airport, the sanitary, the old Ralston Street Lagoon to receive wastewater from the sanitary POTW. So, we have been involved in rather large-scale projects, as well, but the interesting thing is these small dry cleaners cause just as much environmental impact as some of these larger manufacturing sites. It sort of goes against the grain of what you might think, but these small dry cleaners, these releases of perchloroethylene, can be upwards of a million and a half to two million dollar cleanups–so they’re really expensive–and, of course, the real problem here is that these small mom and pops just have no way of paying for those cleanups. If it wasn’t for our ability to go back and find old insurance policies that can pay for these expensive cleanups then those sites would end up being orphan sites, that the EPA might have to take over, which means it would be on the taxpayers to eventually clean up. 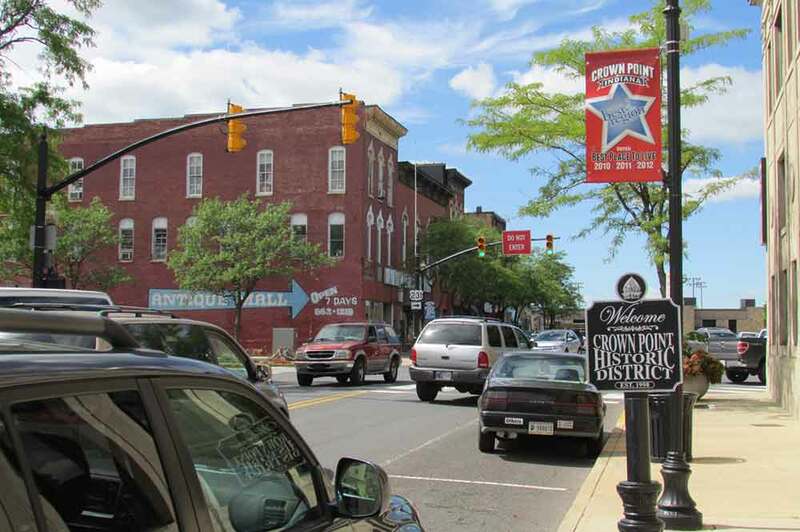 Image of Downtown Crown Point, Indiana. Nolte: That would be a tough place to do a Brownfield project with the EPA because that’s right smack in a residential and a commercial area of Crown Point. Can you fill us in on any other related projects that you and your folks at EnviroForensics are working on now? Henshaw: Well, we’re now embarking on a number of projects in the area. There are some abandoned sites within Hammond and we’re working with the City of Hammond to restore a couple of those old, abandoned sites there. Probably can’t release their names at this point, but there’s still a number of manufacturing sites that EnviroForensics has been asked to come out and take a look at to see if we can use our unique approach of finding those old insurance policies. We have an insurance archeology division that goes all over the country looking for and finding old insurance policies. These policies, again, are not written for cleaning up contamination. They were written as normal slip and fall policies; normal CGL policies, but because they didn’t have exclusions for pollution, they are able to be used to address environmental contamination, asbestos exposure, and other claims that might come about. So that is something we are active in all across the country, and certainly in Northwest Indiana. Nolte: Well, Steve. Thank you very much for bringing us up to date here on a pending closure with no doubt soon-to-be new owners of the site that used to be so contaminated it had to close up–until you folks with EnviroForensics were able to get in there, and get the cleanup not only done but also make it available for somebody to be able to take on as a new property someday. Thank you for being with us to talk about it. Contact us today to restore value to contaminated properties.